The city of Thermopylae is famous for many reasons, mainly the Battle of Thermopylae during the Persian wars. It’s name actually means “hot springs” or “hot gates,” because of the hot sulfur springs in the area. The city lies to the north and west of Athens, and it contains a coastal pass between the mountains and the Gulf of Malia that connects Thessaly and Lokris. Much of the information that we have concerning Thermopylae, and especially the Battle of Thermopylae, comes from the author Herodotus. His work called The Histories includes the research he conducted about the battle (mostly contained within Book 7), along with some of his own opinions about what happened. The city of Thermopylae is connected to several mythological tales. According to some, Thermopylae was believed to be one of the entrances to Hades. In the story of Heracles, he received a cloak infused with hydra poison that he could not take off. It was supposedly the river at the base of Thermopylae where Heracles jumped in to remove the poison on his cloak, after which the river became hot and stayed that way ever since. After the famous Battle of Thermopylae, there were several monuments constructed to honor those who died. The epitaph of Simonides was constructed on top of the burial site of the Spartans, on the hill in which the Spartans and Thespians made their last stand. The Leonidas Monument is a bronze statue of the Spartan king, with a marble frieze underneath honoring the heroes that were distinguished in the battle and those who were recorded by Herodotus. Their names and the city-states that they were from are also recorded with them. There is a monument dedicated to the Thespians as well, which features the god Eros, whom the Thespians revered most. Underneath this statue is a stone plate that explains all of the symbolism of the figure. There are other sights to see in Thermopylae besides these memorials. For example, the hot springs for which the city gets its name still reside at the foot of the hill by the city. Additionally, the pass through which the Spartans battled the Persians is still there, now with a main highway cutting through the center. The Battle of Thermopylae is one of the most renowned battles in Greek history. Like the Battle of the Alamo, it became an example of heroic resistance against numbers far greater than their own. The battle has inspired a metaphor of the resilience of the Greeks, and it has become famous as a testament to Greek pride, despite the fact that the Spartans lost against the Persians. And even though they did lose the battle, they did a good job of fending off the Persians for as long as they did. This brief success was mainly due to two reasons: the first being the topography (the pass where they fought was only about 100 meters wide), and the second being the amount of military training that the Spartans had. During this battle in the Persian War, Xerxes and his Persian forces faced off against Leonidas and his Spartan forces, with help from Thebes, Thespiae, and several other Greek city-states. They struggled to defend Attica and Boeotia while the Greeks at Artemisium defended against the Persian navy. 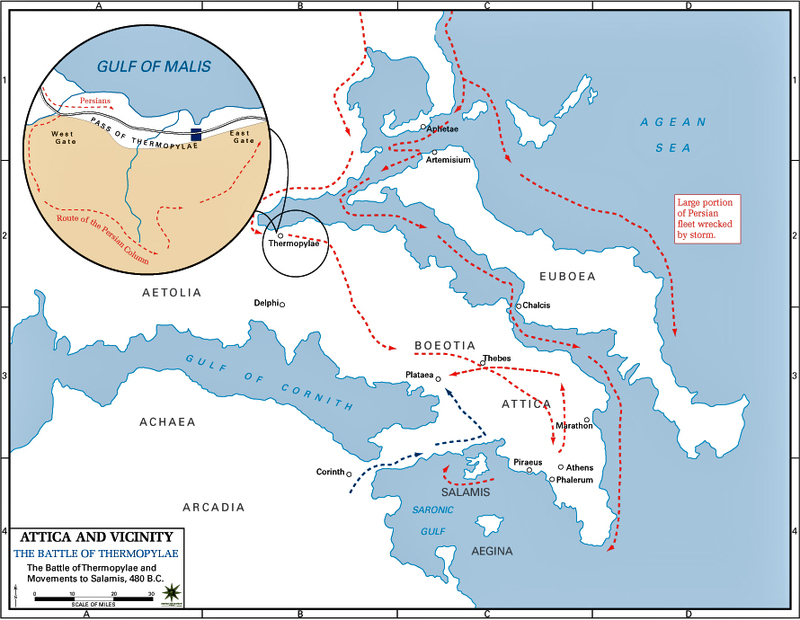 They managed to hold their own against the Persian forces for three days, despite being extremely outnumbered, before they were overtaken; Leonidas ended up releasing the majority of his army to defend other parts of Greece, leaving only 300 Spartans, 700 Thespians, and 400 Thebans to stay at the pass of Thermopylae. Every single one of these Greeks were killed, but the Persians in turn suffered tremendous casualties. After the battle, the Persians proceeded to move throughout Boeotia and sack the city of Athens, though many of its citizens were able to escape.